A. A notice distributed by means of telecommunication containing information concerning the establishment, condition or change in any aeronautical facility service, procedure or hazard, the timely knowledge of which is essential to personnel concerned with flight operations. B. A package which consists of the following elements : AIP, supplements to the AIP, NOTAM, AIC, checklists and summaries. C. A publication issued by or with the authority of a state containing aeronautical information of a lasting character essential to air navigation. D. An Acronym for a system aimed at advance notification based on common effective dates, of circumstances necessitating significant changes in operating procedures. Sorry, file temporarily unavailable. Please check back soon. This is a sample EASA ATPL written test prep question from the Air Law and ATC Procedures test. For more information about the Air Law and ATC Procedures test bank, click here. 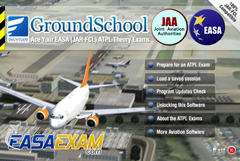 For the answer to this question, please download our GroundSchool EASA ATPL Written Test Prep Software and Apps. Our software will generally be considerably more up-to-date than this web page and will contain a much more complete set of questions. The download is free - give it a try! Copyright, Content, and Accuracy Notice: . Dauntless Software grants visitors permission to use the contents of this page for personal use - commercial or public use, including collecting (or harvesting) of any data or material on this page is strictly prohibited. This material is presented for informational purposes only and may be in error. Dauntless Software works hard to maintain our EASA ATPL question banks. If you see an error on this web page, it is likely NOT an error that is repeated in our software, as our software (unlike this web page) is connected to our editorial mechanism whose mission is to quickly identify and correct errors. If you see what you believe to be an error, please download and try our software to see if the error is repeated there. If you believe it is, you can use the issue-reporting mechanisms within the software to contact our editors about any concern you may have and we will be happy to look into it promptly.